Despite the volatility in Apple (AAPL) shares, price has maintained a consistent trend structure with plenty of bull and bear flag trading opportunities (see my prior update from November) along the pathway. Let’s update our Apple price structure and key levels and note the bull flag that triggered earlier this week. I color-coded the downtrend structure (lower lows/lower highs contained within a falling parallel trendline structure) and the bullish reversal in early 2013 (note the divergence, momentum Kick-off, and the impulsive breakthrough above the falling trendline) which continues to this day. I also highlighted the series of bear flags (trade set-ups) in the downtrend and the corresponding bull flags that developed during the uptrend. The recent bull flag retracement took price into the $540 price level and we see an upside gap above the falling trendline after a steep but shallow flag/retracement pattern. For those new to charting and finding trading patterns or set-ups, I suggest beginning with the trend structure in motion and this is done by labeling the progression of price swing highs and swing lows. It’s ideal – though not required – if you can also connect the highs and lows with trendlines as I’ve done with Apple; this way, it makes it easier to spot potential reversals on breakouts of the trendline ahead of price creating its first higher high (or low) in a downtrend. Structure itself is not reversed until price can build a higher high, higher low and then trade above the prior higher high. For Apple, the official ‘reversal’ signal did not occur until August with the impulsive power-breakthrough above the $470 price level. As we’ve seen many times with examples of “Strong Stocks Getting Stronger,” we prefer to trade in the direction of a trend (with breakout or retracement/flag strategies) until the trend itself is structurally reversed. 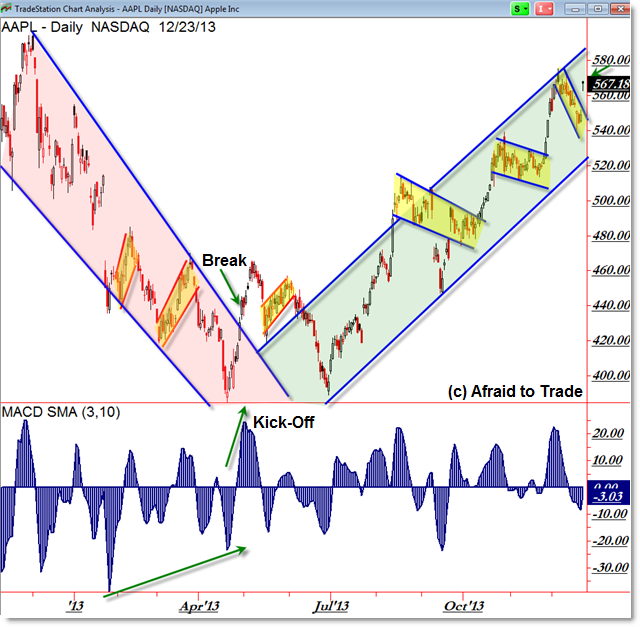 Until that occurs, Apple – like many other stocks at the moment – continue to suggest better odds of additional higher prices in the future than of immediate reversal.